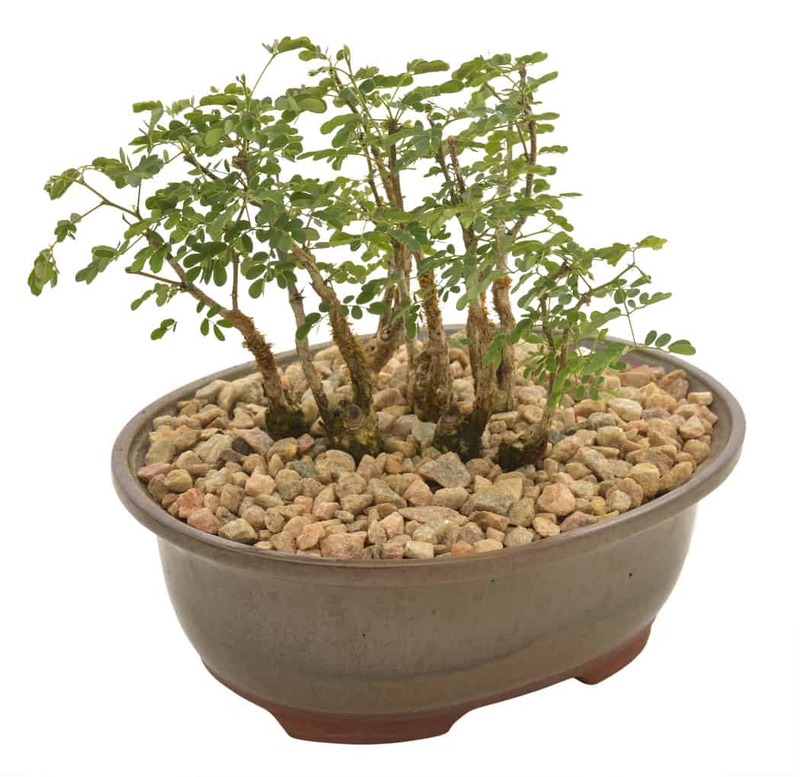 Bonsais are miniature trees, kept small by restricting their growth space in a pot – not by cutting their roots. Simply placing a tree in a small pot does not make it a bonsai. It is a living, growing plant and a continuous work in progress. As such we have put together some information to guide you in growing your own bonsai. When purchasing a bonsai, it is important to read up on the specific tree of the bonsai that you have bought and how it thrives in the wild. The conditions that it prefers in nature are the conditions that you should replicate when caring for your bonsai. Take note of water and light requirements, growth habits and typical shape. This will help guide you in where to keep your bonsai, how to prune it, as well as how often and how much to water it. Bonsai pots are generally very shallow and because it does not hold a lot of soil, the size controls the root expansion. The soil in the pot stabilises the tree and supplies water and nutrients to the roots. One or two drainage holes at the bottom of the pot, covered with mesh, will provide sufficient drainage. Take note: because of the small size and shallow depth of bonsai pots, your bonsai will need a lot more water than other potted plants and trees – see our watering guidelines below. Generally, bonsai will need regular watering – usually every day in summer and less in winter if it is deciduous. Use a watering can or hose with a fan nozzle to water your trees. Spray bottles do not deliver enough water to thoroughly wet the soil. Click |HERE| to read our blog about general watering guidelines. But it is also important to do research on the bonsai variety that you have (like we mentioned before) and to let the usual watering requirements of the tree guide you in watering your bonsai. Then adjusting that basic guideline to suit the smaller size. 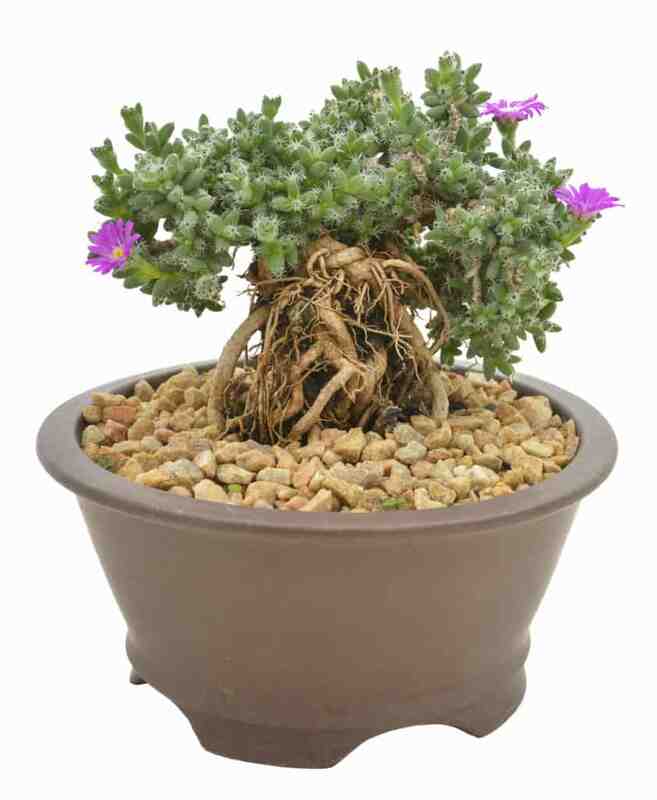 Bonsai thrive on a general purpose organic bonsai food, mixed according to the manufacturer’s instructions and applied after watering at the recommended intervals indicated on the bottle/box. You can visit our plant doctor section or enquire at our inside information desk for assistance in finding a bonsai food. Bonsai need plenty of light for healthy growth. Ideal situations are airy verandas, shade houses or in the dappled shade of a tree. Bonsai trees can be grown in an east facing position where it will receive morning sun, but if placed in a full sun position where it will receive midday or afternoon sun, the trees may suffer, because the small amount of soil they grow in dries and heats up excessively. Once again, it is important to understand the conditions of the tree itself when grown wild in nature try to replicate this as much as possible. Trees sensitive to cold will need protection from frost and wind in winter. Bonsai are not really well suited to indoor conditions, but can be placed indoors on display for short periods of time. 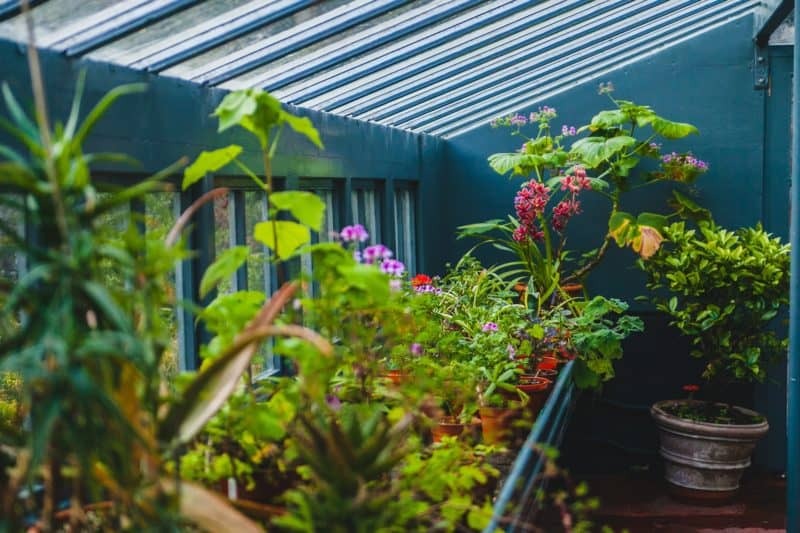 There are also some varieties that can do well indoors in space that gets morning sun and where an adjacent window can be opened to give the bonsai fresh air. Research your variety before keeping it indoors detrimentally. Because bonsai are grown in an easily controllable environment and kept in ideal conditions, they can grow quite vigorously. As such bonsais need regular pruning. As with all pruning, remove the dead and unhealthy growth first. Then allow the lower branches, which are the oldest and thickest, to be the longest. And as the branches get higher, they should get thinner and shorter, giving the tree a loosely triangular shape. 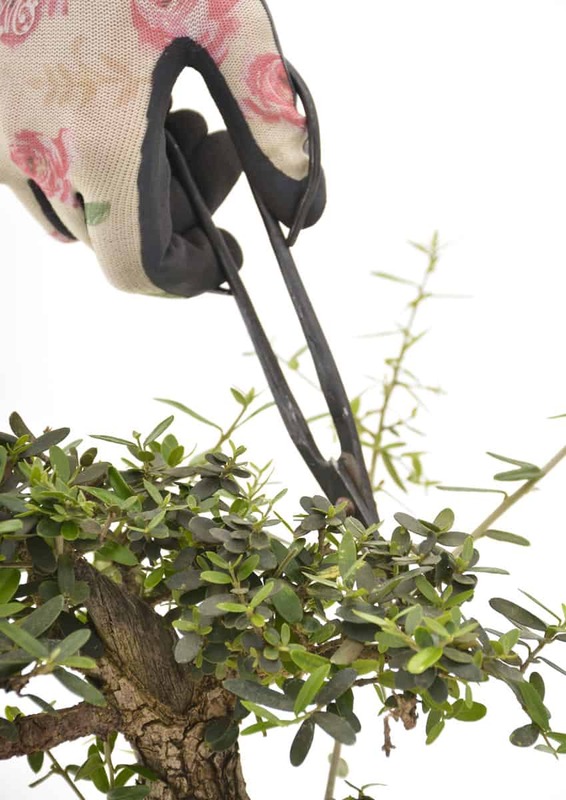 Pruning lets light into the tree, reduces leaf size and encourages branch development. Work with nature and allow your tree to look like its natural counterpart. Forcing a tree into a shape it does not naturally grow in will result in constant conflict between you and your bonsai. Some bonsai will need to be re-potted on an occasional basis as they grow. This is when you can also prune the roots (more on this below) and refresh the soil. Young bonsai will obviously grow whilst they are establishing themselves, but established bonsai will remain in the same pot for many years – just having an occasional root prune and refresh of soil in order to revitalise the bonsai. When bonsais are young and growing they could need to be re-potted into bigger pots until they are established and at their ideal size. However, bonsai are meant to remain small – this is the beauty of these miniature pleasures – and as such you should not keep allowing them to grow bigger and re-potting them into bigger pots as you usually would with other plants and trees. Note that some bonsai will not need to be re-potted at all and will be happy in the small pot that you first buy/plant it in. Others will grow too big, and if they look unhappy in the pot, then you can consider re-potting them into a larger pot. Pruning the roots of your bonsai encourages the development of new roots and stimulates continual growth. It is in this way that bonsai can live for many many years. We recommend that you prune the roots of your bonsai once a year. You can check for thick roots growing around the sides of the pot or even over the edge or through the drainage holes (if not then you can leave the roots for another year before pruning) and ideally you should cut about one third away from the sides and the bottom, and then place it back into the pot and add fresh soil. It’s as simple as that. As long as your bonsai has many healthy feeder roots, the unnecessary thick roots can be removed and the bonsai will still remain healthy and able to take up the nutrients from the soil. Bonsai need an outdoor, protected area, regular watering and feeding and constant pruning in the growing season. In return they will be you pride and joy – living sculptures in wood, created and carefully tended by you!